Thanksgiving, at least at my house, is not the time for the joy of discovery, but for the pleasure of the familiar. It's all about tradition and so every year we have both pecan and pumpkin pie (and also fallen chocolate soufflee cake for the family pie haters). 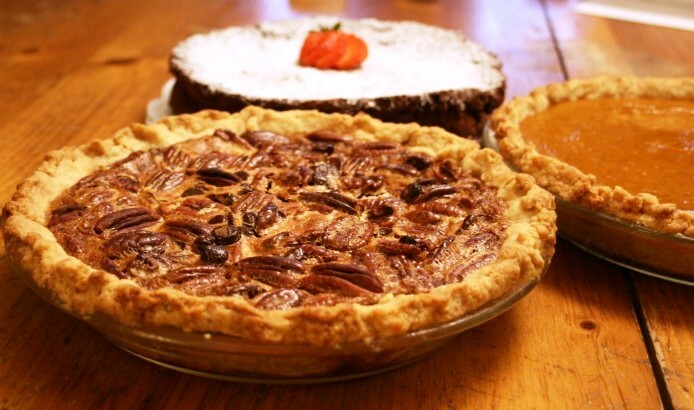 The pecan pie recipe I use is one by American food writer extraordinaire, outlaw cook John Thorne. And I like it so much, I'm sticking with it, instead of trying one of the several in my hand-written recipe collection. 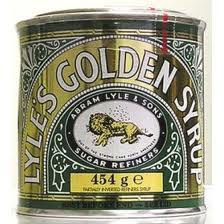 Lyle's Golden Syrup is an excellent replacement for corn syrup. Ever since corn syrup became the devil a few years ago, everyone has been looking for a viable replacement for this key ingredient in pecan pie. These discussions are all over the internet and can occupy one for hours on end, until you manage to pull yourself away from the computer, right before mental exhaustion prevents any baking at all. But never fear, for in the midst of one of these discussions, someone posted this beauty from John Thorne. I've never looked back. And you won't either. It uses Lyle's Golden Syrup, a delicious sugar syrup made in England, but increasingly available here in the US. Preheat oven to 350F. In a large saucepan, heat the brown sugar, golden syrup and butter to the boiling point. Stirring constantly and scraping back any foam that clings to the side of the pan, let this mixture boil for about 1 minutes. Remove from the heat and let cool while, in a separate bowl, you beat the eggs until creamy. When the boiled syrup has cooled somewhat (don't let it get completely cool), beat in the eggs, salt and pecans. Pour into the unbaked pie shell and bake for about 50 minutes. If the crust browns too quickly, make an aluminum foil "crown" and place it atop the crust. Adding 1/4 to 1/2 cup of heavy cream into the filling before baking makes for a richer, lighter texture. For a sweeter, lighter pie, add more sugar and fewer pecans; for a denser less sweet pie, add more pecans and use less sugar. Is Lyles Golden Syrup made from cane sugar? I'm having this dilemma with ice cream making. I'd just like to say that I think the nutritional difference between sweeteners for home use is insignificant compared to the bigger issue which is that you ARE eating something sweetened. No sweetener is good for you. I say go with what works and tastes best. And don't eat the whole thing. Unless it's Thanksgiving - then eat two!! Yes, it's made with cane sugar. Agreed about the whole sweetener thing, but Lyles has a lovely flavor. The irony for me is that I don't even mind Karo corn syrup (unlike high fructose corn syrup)and use it all the time in baking. Happy Thanksgiving! @Anonymous: What a great idea! Thanks for posting. Do not let the sugar mixture cool too much! I did today, and had to start from scratch, as it turned into a sticky ball of candy and would not mix in with the eggs!